We stopped dead in our tracks and just stood there, wondering what was coming next. After a couple minutes the energy shifted, and was gone. On that cold September day in the mountains I was at a hard place in my life, struggling for answers to my challenges. 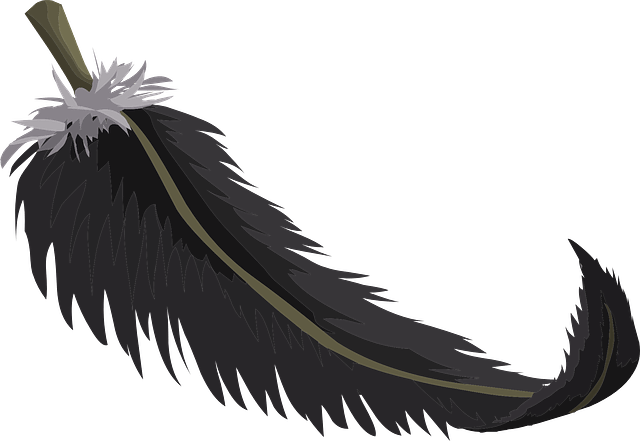 As I later discovered, that big beautiful black feather (which I still have) was simply a sign from my spirit guides that they were with me always. Ever since that day all those years ago, feathers have been Spirit’s “calling cards” for me. The feathers appear regularly, often when I want reassurance that a decision I’ve made is the right one. Or when I’m doubting myself and need some support. There’s no question or doubt in my mind these feathers are signs from Spirit, telling me all is well. We all receive these signs. It doesn’t matter if they are feathers, flowers, a message from an animal, a “chance” meeting with a stranger with the answer to a question we have. And so on. Pope Francis considers white roses as his sign from Spirit, usually from Saint Therese of Lisieux. The signs can take many forms. But we won’t see them unless we expect and look for them. Of course, the most powerful and trustworthy signs are those that come from within us. Years after that wintry day in Yellowstone, at another challenging time in my life, Spirit spoke directly to me. Here’s part of what they said. Spirit speaks to you often. Yet you do not hear because you’re not listening, you’re not watching. The signs are all around you. They come to you in ways expected and unexpected. But you’ll never hear or see them unless you remain constantly watchful. This is the single most important task you can do in this lifetime: Be constantly watchful for the signs of Spirit speaking to you. You will find Spirit speaks to you as easily and clearly as your friends and family on the earth plane. Your higher self is always in a state of perfect bliss, perfect joy, perfect peace. It is a state of high consciousness, but with total awareness of your total reality and existence in the moment. If you are fully present in the moment with love, there can be no pain, no sorrow. There can nothing but total peace. The peace, as your Bible says, that surpasses all human understanding. When you achieve that state of high consciousness — and you can fully achieve it while still incarnated — you will once again have become one with Spirit. Then, when Spirit speaks to you again, you will hear only the sound of your own voice. Here are Esther Hicks and Abraham talking about the meaning of signs. What are the ways Spirit speaks to you? Please share your thoughts and comments with us below. I smile, and sometimes laugh out loud at signs from Spirit. For me it can be almost anything, even the doorbell ringing when not expecting anyone, or anything from the animal kingdom. There are so many signs right after I think “oh, I want that. or Oh, I wish…..”, and suddenly it happens, often in a humorous way. An example: I had 2 spigots leaking water that I couldn’t fix, wished for a plumber, and a neighbor of mine “just happened by” and asked if there was anything I might need him to do. He is a plumber. See what I mean? I really appreciate the humor because laughing chases all negatives away. I also receive those deep heart loving signs and tears roll from my eyes. As I was driving home from far away, I was hoping there would be no snow or ice on the highway, and was very nervous when it began to snow. Then, the clouds lowered into the canyon very softly. They were hard to see through, like dense fog. This was my message to go slowly, and everything would be all right. I can’t remember being without the messages. It is so beautiful to be alive and knowing you are loved and doing well. Thanks very much, Mikala, for sharing your wonderful stories. As you said, it’s great to be alive and know we are always loved. P.S. Glad you got home safe and sound! I’m surprised and delighted that the number 11 I always thought was special to me is special to others for no obvious reason. In my case, it’s the date of my birth when I will be 80 next month. (I also happen to live on the 11th floor of my apartment building because that’s where I found an apartment that has a good view of the sun afternoons and evenings at sunset.) Thank you John for all you do. I read this article this morning and as it is my sister’s birthday (she passed five years ago) I decided to ask for a sign to connect me to her. Sure enough on my way to work a robin greeted and followed me (well actually kept flying in front of me all the way to the door! At one point the robin perched on a stump so close to me so that I couldn’t fail to realise it was Patty, my sister, saying hello. The robin was always her favourite bird. It was such a beautiful experience. It made me feel very joyful. I shall look out for more signs from now on. Thanks very much, Margaret, for your beautiful story. I’m sure it did bring much joy to you. Great article and very timely for me. In the last couple of weeks I’ve been seeing the number 11 and multiples of it everywhere. I even told a friend that I was being followed by 11’s. Clocks, house numbers, license plates. I had a feeling that it was spirit saying hello and reminding me that I am connected. Great stuff! Thanks very much, Laki! 11 has been a significant number for me also, and for many years. It’s always conforting to see how Spirit looks after every one of us! Thank you, John. I understand what you mean about Spirit sending us signs and enjoyed reading your story. It’s comforting when we get those signs and seems to soothe our souls at the perfect time when we need it. I also especially liked how Abraham explained it as being aligned when we experience these signs. I see 11:11 on the digital clock a lot and when it shows up, it always stops me in my tracks as significant and a moment I need to pay attention to but, now, I can also acknowledge it as my alignment with Spirit. It’s tender when I see these signs and realize the connection. It touches a place deep within me that words can’t express. Pure signs of love being sent to us everywhere in every way. Thank you for sharing. I was just telling another friend how comforting these signs from Spirit are for me. As you say, the signs come exactly when we need them. I also get number alignments from Spirit a lot. It’s always so deeply touching, knowing we are loved and cared for, even in our darkest moments. Thank you, Pat, for your sharing. I hope all is well with you. All is well, John, thank you and I agree how comforting these signs can be. I just had a couple more come to me with 11:11 showing up on my microwave this morning and birds all collectively chirping at me the other morning that it stopped me in my tracks. It wasn’t alarming just intending to get my attention to let me know of our connection to Spirit and that all is well. It was so loud and when it stopped so abruptly I was amazed at the silence. Touched my heart and brought tears to my eyes. Lovely beautiful signs! Thank you very much, Pat. These signs certainly are comforting. We truly are never alone. Yesterday I had an experience similar to yours with the birds. As I stepped out onto the porch, I spotted 12 or 13 crows at the top of a tall tree in the garden. They were very loud. Around here I had never seen more than one or two crows at the same time. I walked up to the base of the tree. The crows, normally pretty wary of humans, just sat there looking at me. As you said, lovely beautiful signs! Loved your story with the crows, John. Just seems to be a connection with birds where we’re both feeling and seeing these signs. Sweet! Thank you, Pat! Birds (and feathers) are powerful signs from Spirit. It’s a lovely “coincidence” we are both seeing these signs.